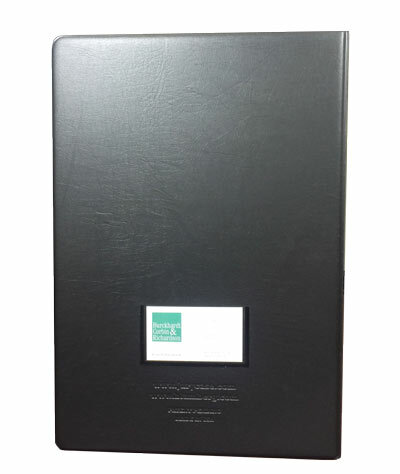 The Jury Case® "Your Voir Dire Organizer"
The Jury Case is the Voir Dire Organizer for the bench and the bar that makes jury selection more efficient, keeps the attorney connected to the jury during trial and aids in the formulation of the closing argument. "I used The Jury Case to organize my Voir Dire in complex medical malpractice cases tried in the N.Y. Supreme Court - Kings County and Westchester County - and in a products liability/medical malpractice suit tried in the Federal District Court - Manhattan. 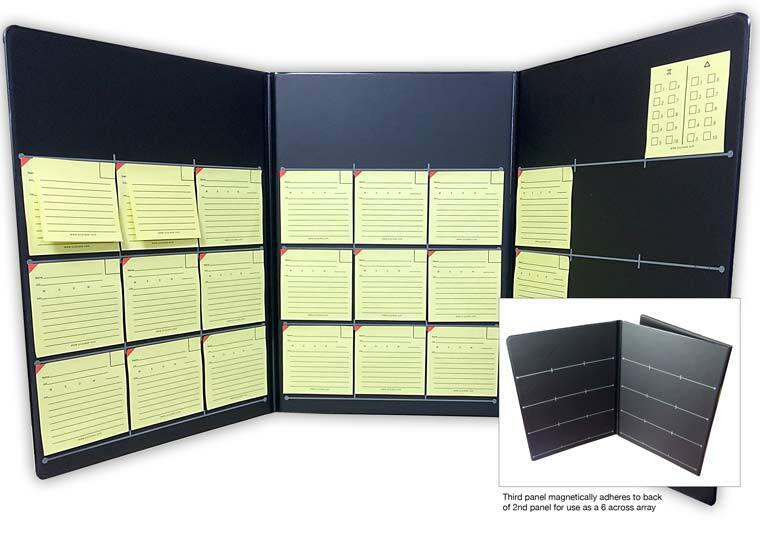 The product allowed me to better organize my Voir Dire notes and to keep track of each juror. It was particularly helpful with the large federal court panel, which is otherwise a scramble. Opposing counsel in the federal case was also impressed with The Jury Case. At the end of the trial, he asked about The Jury Case and where to purchase one." "I used The Jury Case for a seven-day jury selection and it worked great. It is most helpful to see the positioning of the alternate jurors who are going to move into the jury box before exercising peremptory challenges. I highly recommend this product to all trial attorneys." "The Jury Case system adapts to all courtroom settings and makes the selection process more organized and efficient. An excellent tool." "Having used The Jury Case in my last two trials, I will never pick another jury without it." Product consultant and first user in trial. 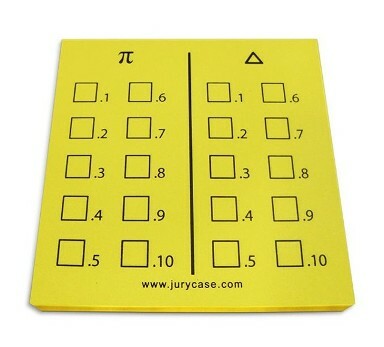 The Jury Case is a tri-fold that measures 11" x 15" x 1/2" (2.1 lbs.) and opens to display a 32" x 15" jury selection grid ("Jury Board") across the 3 panels. 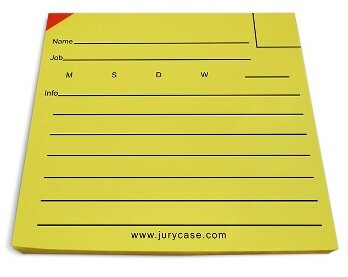 The Jury Board holds a series of self-adhesive notes ("Juror Tags") which are lined to record pertinent information for use in the jury selection process. The seat number of each juror is prominently displayed on the upper right corner of the Tags, which are shifted around the seating chart as jurors are excused for cause and by peremptory challenge. A Peremptory Tag keeps track of the challenges made by both sides. The grid duplicates a "6 Pack" or "9 Pack" seating arrangement but can adapt to other seating arrangements employed by the court such as 7 jurors in the first two rows. A total of 36 Juror Tags fit on the grid. The Panel Cards hold an additional 60 Juror Tags for large venires. This jury selection system works for judges, jury consultants and attorneys for the plaintiff, defendant, prosecution and accused. Contents: The Jury Case tri-fold, 2 pads of Juror Tags (50 sheets per pad), 2 pads of Supplemental Tags (50 sheets per pad), 1 pad of Peremptory Tags (25 sheets per pad), 10 Panel Cards and our new Jury Poll Pad (25 sheets per pad), Operating Instructions and "The 6 Keys to Jury Selection." The Top Juror Tag records the pertinent juror information including job, marital status and number of children. The red corner allows the Tag to be located when the Supplemental Tags are stacked on top. The juror seat number is recorded in the box on the upper right corner. (3.25" x 3.125"). Click on the image to see an exemplary Top Tag in process. Business Card Holder allows you to insert your business card in the sheath on the inside fold. 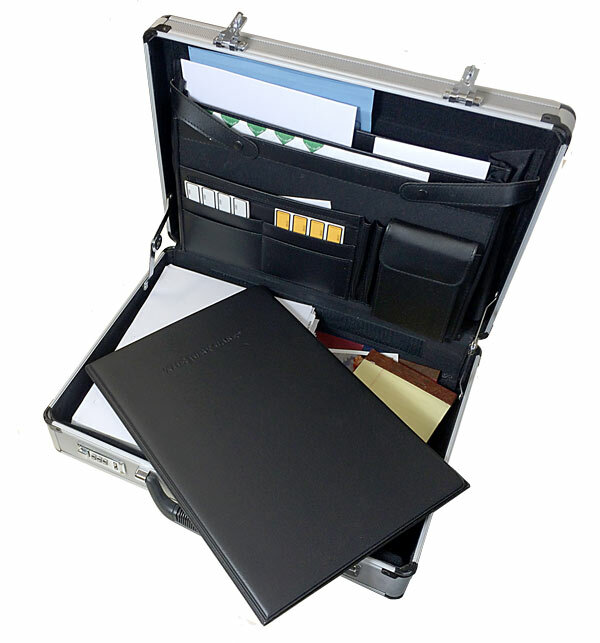 The tri-fold case folds up quickly into a sleek portfolio (11" x 15" x 1/2", 2.1 pounds) that fits into a standard briefcase or can be carried alone. A recessed magnet keeps the case firmly closed when not in use. If jury selection lasts through the lunch break or overnight, fold up the case with all the Juror Tags in place. They will remain in position. The Jury Poll Pad records the juror votes in response to all the questions on the verdict form. This product does not reinvent the wheel. It just makes the wheel stronger and faster. 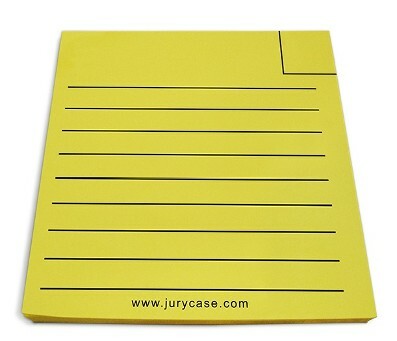 Attorneys, judges, court clerks and jury consultants use "sticky notes" during jury selection because they work. Computer applications simply cannot keep up with the quick, almost frantic, pace of jury selection. In addition, the attorney often loses eye contact with the panel as he inputs information to his laptop or touchscreen device. That is why sticky notes have been used for almost 20 years in courtrooms around the country. The notes provide space to record juror information through shorthand notations, and when the first alternate takes the seat of an excused juror and the entire row of alternates shifts their seats, the notes can be moved accordingly. But in the past, the notes were affixed to a legal pad or to a manila folder or stuck on counsel table. The durable Jury Board is composed of custom-blended polyurethane materials that hold the Juror Tags firmly in place. The Tags can be shifted back and forth around the grid numerous times without losing their tackiness, unlike a paper or cardboard surface which saps the adhesive. The board is smooth and firm and provides a perfect surface upon which to write. When it is your turn to question the panel during Voir Dire, pick up your Jury Case and place it on the podium. The Tags will not shift or move. You can bring the Case with you to sidebar or hold it while standing at the rail. This revolutionary product allows the jury consultant, associate attorney, insurance company adjuster and the client to participate in the Voir Dire process without distracting the trial attorney. It can also be used by the judge, the court clerk, and the bailiff to help manage the jury panel. Notable results include a $128M verdict in a real estate development case, a $34.5M verdict in a leg-off case, a $15.3M verdict in a bus accident case, a $6M verdict in federal court in a whistleblower case (lawsuit settled prior to punitive damage phase), a $4.014M verdict in a personal injury case, a $572K verdict in a wrongful termination case, a defense verdict in a medical malpractice case and a murder conviction in a gang violence case. Who is already using The Jury Case and what are they saying? "I used The Jury Case for a seven-day jury selection and it worked great. I highly recommend it to all trial attorneys." "There is no easier or cleaner way to keep organized and stay on track. It will show." "Jury Selection is part art, part science, and part intuition. The Jury Case provides the organizational tool to optimize this critical aspect of a jury trial." "The Jury Case should be part of every lawyer's trial kit." "The Jury Case makes jury selection easier, portable and more graceful." "Stop fiddling with manila folders, notepads and computer applications. I pick dozens of juries each year throughout the country with a variety of seating arrangements. The Jury Case is the best method to record information during jury selection." U.S. PATENT NO. 9,189,971 - Made in USA. For more litigation tools and supplies click here.